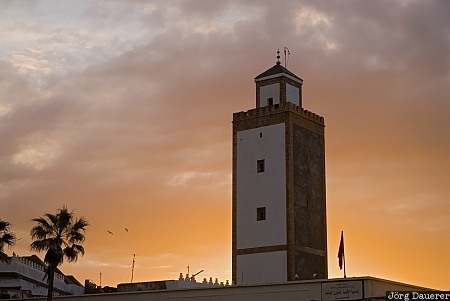 The minaret of the Mosque Ben Youssef in Essaouira in front of a colorful sunrise sky. Essaouira is in Marrakech-Tensift-Al Haouz at the Atlantic Coast of southern Morocco. This photo was taken in the morning of a sunny day in February of 2010. This photo was taken with a digital camera.